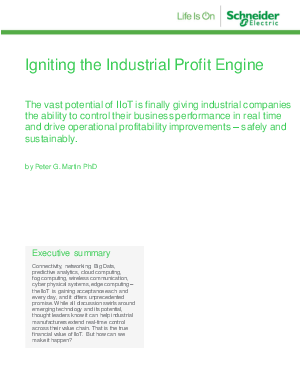 The vast potential of the IIoT is finally giving industrial companies the ability to control their business performance in real time and drive operational profitability improvements – safely and sustainably. Connectivity, networking, Big Data, predictive analytics, cloud computing, fog computing, wireless communication, cyber physical systems, edge computing – the IIoT is gaining acceptance each and every day, and it offers unprecedented promise. While all discussion swirls around emerging technology and its potential, thought leaders know it can help industrial manufacturers extend real-time control across their value chain. That is the true financial value of IIoT. But how can we make it happen?